The Food Allergy Queen: Wraps made from 100% coconut. Excited. Wraps made from 100% coconut. Excited. Has anyone seen, heard or eaten these before? Wraps for sandwiches made completely from coconut and salt! Free of everything except coconut! Ordered some here from Improveat, will give you a review when they arrive. Oooh! Looking forward to these for my daughter who can't eat rice. 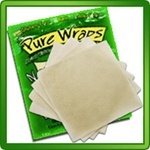 These wraps are also suitable for Raw Vegans. I have not tried them yet myself, but I've heard that many Raw Vegans love these wraps.